Exclusief: In de nieuwe Cosmo Girl! (13 december) magazine is een nieuwe foto te zien van de 2009 Harry Potter and the Half-Blood Prince shoot door Dennys Ilic. Niks nieuws in de interview behalve de bands waar hij over praat. English: Want the translation in English? e-mail me. 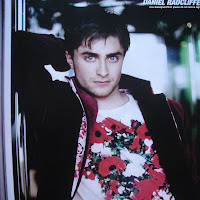 Little boys grow older and hotter!..When we look at Daniel Radcliffe in “Harry Potter and the Half-Blood Prince” then. Time for more information on Daniel. You are 8 Harry Potter movies further. Aren’t you almost become Harry yourself? 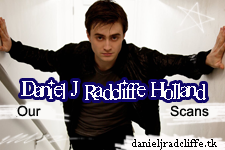 D: Harry is amazing and it’s great to play him. But then I hope that people can see him besides me. I also had a role into the play Equus, which even made me stand naked on the stage! Scary, but also great to know that I can do more then just Harry. And then.. after 10 years of filming, you are ready with filming from the last Harry Potter movie.. strange.. or maybe even relaxed? D: Very odd.. to not be able to come back to the set after it will end. It was just a nice idea to know that, besides my other projects, the role of harry always waited for me. Now I know that it will end soon, it isn’t so great. And not to be able to work again with all the friends I made on the set is of course not so great. But I won’t miss all the table tennis tournaments with Emma. I am able to beat Rupert most of the times, but Emma is so good at it, she always wins! How Is it to see the first movie again? D: It keep strange to look at yourself and to be honest I always get a weird feeling into my stomach when I look at my earlier acting performances. I haven’t done that in a long time. Mmm.. maybe even a good idea. Then can I see how much I have been grown. Literally and figuratively haha. You love music. To which bands do you listen the most right now? D: Vampire Weekend is a-ma-zing. Everyone should listen to that. The music from Laura Marling is also on my playlist, she writes amazing song texts. Just like Adele, by the way. And now I am already starting: I’m also a fan from the bands: The Wombats, Beirut, and Mars Volta. Listening to music and explore new bands. I love it! Wouldn’t you like to play in a band yourself? D: No.. I absolutely don’t have enough musically talent for that. It would be great if I suddenly get noticed as a great guitarist, but I’m afraid that that will never happen. Parents: father Alan is working at a publishing house. Mother Marcia is a casting agent. - Daniel’s favorite food is fish? - His favorite actors are Cameron Diaz, Scarlet Johansson, and Ben Stiller? - That he hates cockroaches? - That his hobby is photography? - He has dyspraxia? That’s a motor impediment which can make him seem clumsy sometimes. - Binka and Nugget are the names from his dogs? - That he didn’t liked the Harry Potter books before he got the role from Harry? - That he still is struggling with his nerves when he wants to flirt with a girl? - A lot of people confuse him with actor Elijah Wood? - Daniel believes in ghosts? - He had to cry (from happiness) when he saw his name for the first time on the end credits.